A 74-year-old grandmother was taken into custody after a NASA sting operation to recover a small shard of a Moon rock. In an Associated Press article, Joanna Davis said the Moon rock was given to her husband by Neil Armstrong in the 1970s, and she was trying to sell the item to take care of her sick son. However, any samples from the Moon are considered government property, and so cannot be sold for profit. But no charges have been filed and NASA is not commenting on the case. “They grabbed me and pulled me out of the booth,” Davis told the AP. 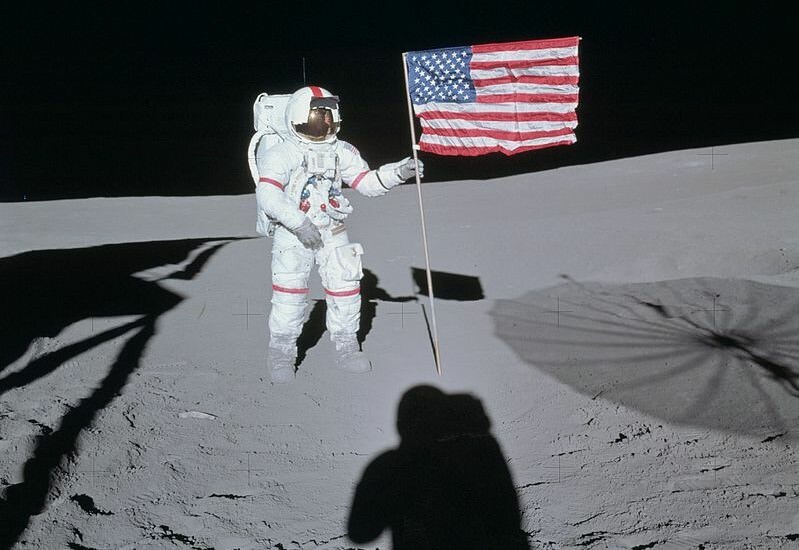 Reportedly Davis emailed a NASA contractor on May 10, 2011 trying to find a buyer for the rock, as well as a nickel-sized piece of the heat shield that protected the Apollo 11 space capsule as it returned to earth from the Apollo 11 mission to the moon in 1969. Neil Armstrong has said previously in a written affidavit that he has never given Moon rocks to private citizens. While Davis’s attorney called the incident “abhorrent behavior by the federal government to steal something from a retiree that was given to her,” according to AP, Davis apparently knew that what she was doing was against the law. You can read more in the original AP article. Long-held secrets continue to be unlocked from the Moon. Researchers taking a new look at a rock brought back by the Apollo 17 mission have discovered graphite in the form of tiny whiskers within the lunar sample. Just like the recent finding of water on the Moon, it was previously thought that any carbon present in the Apollo rocks came from terrestrial contamination from the way the lunar samples were collected, processed or stored. Andrew Steele, who led a team from the Carnegie Institution’s Geophysical Laboratory said the graphite could have come from carbonaceous impactors that struck both the Moon and Earth during the Late Heavy Bombardment, approximately 4.1 to 3.8 billion years ago, and if so, could provide a new and important source of information about this period in the solar system’s early history. The tiny graphite whiskers or needles were found in multiple spots within a specific area of lunar sample 722255 from the Mare Serenitatis impact crater in the Taurus-Littrow region, indicating that the minerals are in fact from the Moon and not just contamination. Steele told Universe Today that he and his team don’t think the graphite originated on the Moon, but haven’t ruled it out completely. He added that the graphite may have come from the impactor itself, or it may have formed from the condensation of carbon-rich gas released during the impact. The team used Raman imaging spectroscopy (CRIS) on a thin section of a freshly fractured surface of the rock. This identifies minerals and carbon species and their spatial relationship to each other beneath the surface of a sample. Steele said even though this rock has been on Earth since 1972, new techniques and instruments allowed for the new discovery. Impact breccias are made up of a jumble of smaller fragments that formed when the moon was struck by an asteroid or other object. Other previous spectroscopy of the Moon’s surface has also found trace amounts of carbon, but it was thought to have come from the solar wind. However, Steele said he and his team have also ruled that out as the source. Steele said their findings indicate that impacts may be another process by which GWs can form in our solar system. Additionally, it appears carbonaceous material from impacts at the time of the Late Heavy Bombardment (LHB), and at a time when life may have been emerging on Earth, does survive on the Moon. While the impacts to Earth during that period have since been erased, craters on the Moon are still pristine, so the Moon potentially holds a record of the meteoritic carbon input to the Earth-Moon system, when life was just beginning to emerge on Earth. The research is published in the July 2, 2010, issue of Science.